The state of Colorado holds a very unique position in terms of the nations space related activities. In addition to being the home for the military's space related organizations including U.S. Space Command, Air Force Space Command, NORAD, and Army Space Command, there is an extensive presence of telecommunications companies which also rely on Colorado's geographic location for effective satellite control and data uplink. Colorado also plays a highly important role in the production of expendable launch vehicles used to place satellites in orbit as well as launch payloads for interplanetary exploration. 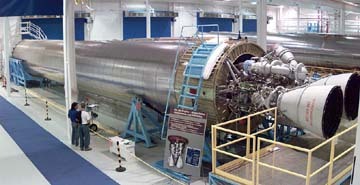 Lockheed Martin Astronautics, located in southern Jefferson county, builds the awesome Titan IV heavy lift launch vehicle, the Atlas expendable launch vehicle, and many other critical pieces of space hardware. Boeing Space Systems builds the Delta III expendable space launch vehicle in their facility near Pueblo. 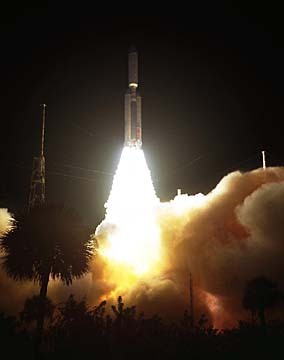 The Titan IV (left) is the nations premier heavy-lift expendable launch vehicle and made by Lockheed Martin in Colorado. The US Space Foundation is headquartered in Colorado Springs, Colorado and is a space advocacy and education organization. The Colorado Space Business Roundtable and the Space Foundation have merged in order to take advantage of their mutual interests. The Space Foundation sponsors the annual National Space Symposium at the Broadmoor Hotel in Colorado Springs. The Colorado Space Business Roundtable was established in 1994 for the purpose of providing a forum to the aerospace and defense industry in Colorado, allowing them to network and share mutual concerns. This business and professional organization includes the military and commercial space industry, academia and telecommunications. Membership in the Roundtable is open to all interested individuals and corporations. The Roundtable has recently merged with the U.S. Space Foundation located in Colorado Springs to take advantage of the mutual interests of both organizations.